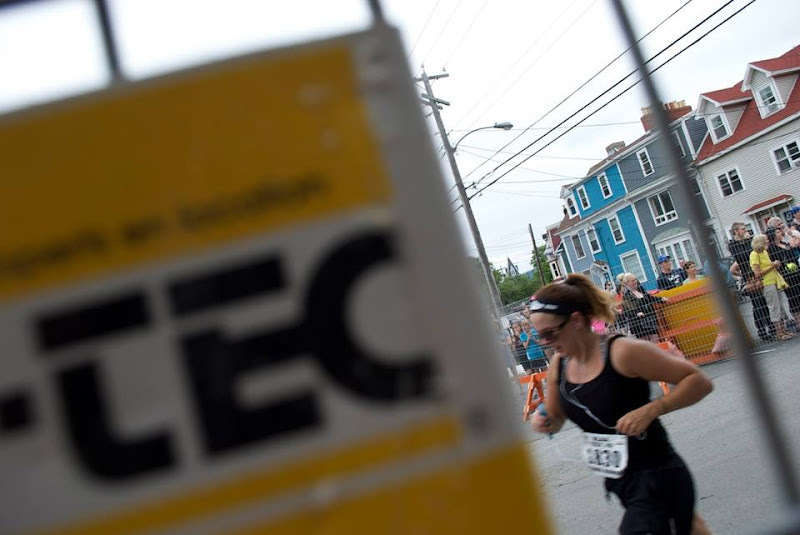 Just a few weeks ago I scratched off one of the items on my to-do list, and that was to run the Tely 10. 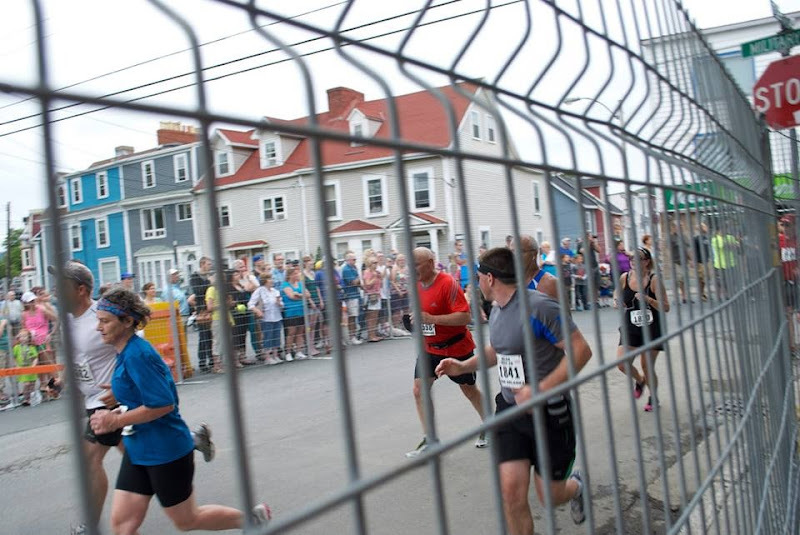 The Tely 10 is a 10 mile (16K) road race that takes place in St. John's every year at the end of July. Todd and I signed up for the race in May and entered as part of a team through our work. One of the main reasons I was so determined to run this race was to support a co-worker of mine, Derrick, who was diagnosed with an aggressive form of leukemia last fall. Derrick was what you would call a hard-core runner. I'm talkin 50+K during the week, Boston Marathon kinda runner. This guy has always been the definition of positivity and I know he's been an inspiration to everyone who has known him. Thankfully, Derrick just celebrated his 100th day since his transplant and he's now on his way back to recovery, cancer free. Although Derrick couldn't compete in this year's race, our team decided that we would all get out there and run it for him (obviously at a much slower pace!). Trying to find time to train for the race was hard. I would do a short run during the weekdays (4-5K), and every time I would try to do a long run on the weekend, something more fun kept getting in my way. Let me tell you, eating like crap, having drinks, and staying up late, quickly puts a damper on any type of movement exercise during the weekend. A couple of weeks before the race I managed to run a 12K and I was impressed because it was the furthest distance I had ever ran at the point. A couple of days later, though, my body must not have been as impressed because I started to have pain in my left hip. I had to put running on hold, and every day I was so worried that I wouldn't be able to run the race. The week before the Tey 10 I managed to try out a 3K and, while my hip was ok during the run, as soon as I was done I found myself rushing to the freezer to grab whatever I could find to numb my hip. Although I was still uneasy about whatever it was I had done with my hip, I made up my mind that night that I was running the race. Race day came and I woke up that morning feeling like I was a university student going to write the biggest exam of my life. I was so nervous, but not because I felt like I was competing or had something to prove, but because I had no idea if I was actually going to be able to run the full 16K. My mom dropped us off to the starting point a little after 7 AM, and I couldn't believe the thousands of runners that were there. Before I knew it, I was lining up in the crowd and listening to the gun go off. For the first minute we were actually walking across the start line because of all of the people. And then we started running. I felt great. I was having so much fun, talking to Todd and his cousin who was running with us, and listening to the people from the sidelines cheering us all on. I couldn't believe it when I looked down at my RunKeeper and it showed that we had already ran 11K. I kept thinking, "I'm actually going to do this". Around the 12-13K mark, my energy level was so far gone. I'm talking running the other direction gone. No where to be found. No where. I knew I had to keep running because that was my main goal, to just run the entire race. Todd kept looking back at me and yelling, "come on Renee, pick it up". Here we are getting close to the end. Todd kept looking back at me to see if I was still alive!! All of a sudden we were approaching the last km and, with the crowd on the sides of the road screaming, I just started sprinting. There it was- the finish line. I swear at that point I was seeing two of them and I just picked which one I wanted to cross. Luckily it was the right one and I finished with a time of 1 hour and fourty-two minutes. This is me sprinting to the finish line. Funny note: When I crossed the finish line and entered the park where everyone went after they finished running, I immediately called my mom to tell her how to find us in the crowd. Me: "BannermanPark, you know where everyone goes after they finish their race"
Mom: "What? You're done? You ran it all?" Mom: "Ohhhh, I thought you were calling me to come pick you up somewhere because you were done, as in you couldn't finish the race"
HAHAHAHA! Thanks mom! In her defense, she told me that she thought I was going to be running for a bit longer so she assumed that it was too early for me to be finished. Wait...I don't really think that makes it sound any better!!! Anywho, all you runners out there know what I'm talkin' about when I say I experienced such a runners high. In all of my life, I was never so proud of myself as I was at that very moment. I kept thinking back to a couple of years ago when I couldn't even run for 1 minute, and here I was just after finishing a 16K race. Me and Todd having a proud moment with our medals. If you look closely, you can see our "Running For Roul" headbands. Todd's cousin Barry ran the race with us and 3 of us crossed the finish line together. My friend Karla was visiting from Edmonton and came out to cheer us on. Me and my mom, who was probably even more proud of me that day. Ps: she treated us to an awesome breakfast after the race for doing so well. Although the Tely 10 was scratched off my list, I've decided that I want to run it again next year and aim to beat my original time. You hear that bad hip? Take it easy on me from here on out, please!